Callipygian Players concert - SOLD OUT. Washington, D.C.--At the Annual Meeting and Policy Forum of the URA Council of Presidents on Wednesday, the mood was upbeat--if cautious. "The good news is the competitiveness agenda is the President's agenda, but it needs to work through the House and Senate," said Sen. Lamar Alexander of Tennessee, who chairs the Senate Subcommittee on Energy. Sen. Alexander is a principle co-sponsor of an important legislative package introduced in the Senate on Jan. 25, entitled "Protecting America's Competitive Edge" (PACE) Acts, consistent with the American Competitiveness Initiative (ACI) mentioned in President Bush's State of the Union speech last week. The PACE Acts respond to 20 recommendations from the National Academy of Sciences' October report, Rising Above the Gathering Storm. "So much of our wealth comes from the post WWII explosion in science and technology," said Alexander, who has also served as US Education Secretary, and as president of the University of Tennessee. "It's a pro-growth policy." John Marburger, Assistant to the President for Science and Technology, provided a summary of the impact of the ACI on the budget requests for FY07. "I came because I wanted to personally show you the numbers going up for the Office of Science," said Marburger, a former director of Brookhaven Lab. "The curves are rising because a lot of you came together to produce a series of reports." 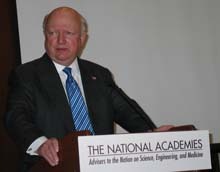 Marburger acknowledged the leadership of Norman Augustine, retired chairman and CEO of Lockheed Martin and chair of the NAS panel that issued the gathering storm report, which influenced the ACI. in the International Linear Collider. The Baseline Configuration Document features 6 km rings which will require pulsers to feed 50 ohm stripline kickers. The 5 kV (kilovolt) pulses must have 6 ns (nanosecond) rise and fall times, and a total duration of approximately 14 ns. Operating in a burst mode, every 5 seconds the kicker will have a 3 MHz (megahertz) burst that lasts 1 ms (millisecond). The combination of the electric component from the 5 kV voltage pulse and the magnetic component from the accompanying 100 A (amp) current pulse will deflect the electron and positron beams. The temporal specification of the kicker pulse presents a challenge to the existing generation of pulser technology. Universities Research Association, Inc. (URA) and the University of Chicago have jointly announced today the formation of their partnership to bid for the U.S. Department of Energy (DOE) contract to manage the Fermi National Accelerator Laboratory (Fermilab), home of the Tevatron, the world�s highest energy particle accelerator. Every year, the University Research Association awards scholarships to children of regular, full-time Fermilab employees with high SAT scores. Applications are available online now through March 1. Questions about the program may be directed to Jeanelle Smith at x4367. Brian Greene, a world-renowned physicist and finalist for the Pulitzer Prize, will speak at Elmhurst College on Sunday, March 5, at 7:00 p.m. in Hammerschmidt Memorial Chapel. The author of two best-selling books, Dr. Greene will explore three key events in modern physics and what they teach us about breakthrough thinking in any area of life. The lecture is free. Learn more at (630) 617-6100 or visit the website. This year's Education Office Family Open House will take place on Sunday, Feb. 19, from noon to 5:00 p.m. Call Nancy Lanning at 630-840-5588 or go to the Fermilab Family Open House Web page to register. The Property Office is currently conducting their Equipment and Sensitive Inventory Campaigns. They recently mailed custodians listings and the due date to return them to the Property Office is today, Feb. 10. The site wide print server, FNPRT, will be inaccessible on Thursday, February 23, 2006 from 6:00am-8:00am due to a software upgrade.